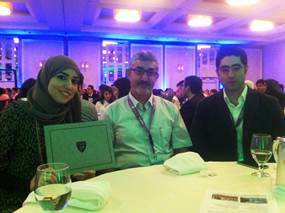 Dina Saad, 2nd place award at the 3rd biannual competition among Canadian construction graduate students, Canadian Society for Civil Engineers (CSCE), Montreal, June 2013. Roozbeh Rashedi, 2nd place award at the 2nd biannual competition among Canadian construction graduate students, Canadian Society for Civil Engineers (CSCE), Ottawa, June 2011. Saied Yousefi, 2nd place award at the 1st biannual competition among Canadian construction graduate students, Canadian Society for Civil Engineers (CSCE), London, June 2009. Research Topic: Integrated Performance Analysis and Optimum Fund Allocation for Capital Renewal of Healthcare Assets. - Hegazy T., Rashedi R., and Ali A., 2012. “Heuristic Approach for Fund Allocation in Complex Rehabilitation Programs,” 3rd International Multi-Conference on Complexity, Informatics, and Cybernetics (IMCIC), Orlando, Florida, USA, March 25-28. - Hegazy, T. Ali, A. and Abdel-Monem, M. (2011), “Prospects of Mind Maps for Better Visualization of Infrastructure Literature”, Journal of Professional Issues in Engineering Education and Practice, 137 (4), pp. 239-247. - Abdel Monem, M. S., Ali, A. I. (2010), “Spreadsheet-Based System for Sustainable Asset Management”, CSCE Annual Conference in Winnipeg, June 9-12, 2010. - Abdel-Monem, M. and Hegazy, T. (2013), Enhancing Construction As-Built Documentation Using Interactive Voice Response. J. Constr. Eng. Manage. - Hegazy, T. and Abdel-Monem, M. (2012), "Email-Based System for Documenting Construction As-Built Details," Automation in Construction, 24, pp. 130-137. Research Topic: BIM-Based Decision Support for the Evaluation of Architectural Submittals During Construction. Research Topic: A Microeconomic Perspective to Infrastructural Renewal Decisions. - Abdel-Monem, M., S., Hegazy, T., Saad, D., A. 2012. “Automated System for Documenting the Evolution of As-Built Details During Construction”. TRB 91st Annual Meeting, 2012. Paper number: 12-4228, Session 236. - Atef, D., Osman, H., Ibrahim, M., and Nassar, K. 2010. “A Simulation-based Planning System for Wind Turbine Construction”. Proc. of the 2010 Winter Simulation Conf., Johansson, Jain, Montoya-Torres, Hugan, and Yücesan, eds., 3283–3294. Piscataway, New Jersey. Rashedi, R. & Hegazy, T. (2014). Capital Renewal Optimization in Large-Scale Infrastructure Networks: GAs Versus Advanced Mathematical Tools. Structure and Infrastructure Engineering, (In Press). Rashedi, R. & Hegazy, T. (2013). Fund Allocation In Complex Rehabilitation Programs. Journal of Systemics, Cybernetics, and Informatics, 11(8), 52-57. Hegazy, T. & Rashedi, R. (2012). Large-Scale Asset Renewal Optimization Using Genetic Algorithms Plus Segmentation. Journal of Computing in Civil Eng., ASCE, 27(4), 419-426. MSc, Civil engineering, 2008, Suez Canal University, Port Said, Egypt. BSC, Civil Engineering, 2002, Suez Canal University, Port Said, Egypt. MSc Thesis: “Cost Contingency Determination Using Risk Analysis for Construction Projects in Egypt". Research Topic: Nanotechnology in Construction.